Stokefield House in Castle Street in Thornbury is still remembered by many people in Thornbury from the time when it was owned by Thornbury Rural District Council and used as it Council Offices. Stokefield Cottage or Stokefield Lodge was the name of a property adjacent to Stokefield House and it was used as accommodation for the caretaker of the Council. The stables next door to it were converted for use as storage etc. 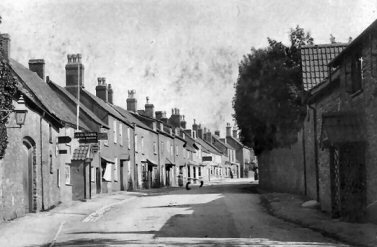 We have few images of the cottage but the one on the left shows its position opposite The Chantry and illustrates how it followed the line of the street very closely. We have another image of the cottage that we have used on the page that details the known occupants of the property. This shows the buildings themselves more clearly. Click here for the photo and for the occupants of the cottages. Stokefield House itself was built by Adrian Stokes from about 1822. What is interesting is that the cottages, often used by grooms gardeners and later caretakers of Stokefield House, were older than the main house. South Gloucestershire Council has been extremely co-operative in letting us see and photograph many of the deeds it holds for properties in Thornbury. The properties on the Stokefield site are amongst these. The earliest indenture dated 1823 shows that Stokefield Cottages were originally one building which was later divided into two properties. Two further houses were built on the neighbouring land. The site of the two last properties is not absolutely clear. In the Tithe Map drawn up around 1840 they appear to have been built onto the end of the row along the line of Castle Street. The cottages were all given the Tithe Apportionment number of 28. This implies that the first known owner was Benjamin Barnard. We have no evidence that this is the same Benjamin Barnard. Benjamin and Susanne Barnard had a son called Benjamin who was baptised on 205th February 1744/5. Thomas and Elizabeth King. The indenture of 1823 goes on to say that the property was once owned by Thomas King of Hill and his wife Elizabeth. Thomas’s will of 31st December 1757 left the property to his wife Elizabeth for her life time and then to their daughter Mary and then to Sarah. We know that Thomas King of Rockhampton married Elizabeth Cox of Hill on 5th November 1730 at Hill. They had at least three daughters all baptised at Hill; Mary King baptised on 1st December 1731, Sarah baptised 12th February 1734 and Anne King baptised on 16th August 1741. Thomas King was buried at Hill on 27th January 1758. Elizabeth King was buried on 8th December 1758. Mary and Daniel Thurston. The same indenture says that Mary King married Daniel Thurston a yeoman formerly of Hill and late of Monmouth who had “long since departed this life”. Thus Daniel Thurston was the owner of this property. This appears to be confirmed by the 1769 and 1770 Assessments for the Relief of the Poor which show that Daniel Thurston was to pay tax for a property described as “Kings” which was tenanted by John Lewis. Land Tax Records for 1821 also show that John Longden occupied what appears to be the same property said to be owned by Daniel Thurston. We cannot account for this as it seems to be after the death of Daniel Thurston. Possibly this later Daniel Thurston is the grandson or the term means the estate of Daniel Thurston. The will of Daniel Thurston of Monmouth left a silver pint cup and some spoons to his grandson Daniel Thurston and his granddaughter Mary Thurston. The furniture and the rest of the property that was originally in Daniel’s possession was left to his son Guy Thurston. The furniture that his wife Mary had owned before her marriage and the stock in trade was left to her. Property in Oldbury was left in trust to his wife for her lifetime and from his other property an income was to be given by his trustees to his granddaughter Sarah. Probate of the will of Daniel Thurston was granted to Guy Thurston on 9th July 1816. We know that Guy Thurston was a tallow chandler in in Bristol. A declaration of his daughter Sarah Barnett nee Thurston in 1874 explains that Guy Thurston died about 1829 and that he was buried in the Tabernacle Burial Ground in Redcross Street in the Parish of St Phillip in Bristol. The properties we have called Stokefield Cottages were left in trust to Guy Thurston for his son Daniel. However the statement of Sarah Barnett makes it clear that Daniel died a bachelor aged 22 in his father’s life time and was buried in said Tabernacle Burial Ground. The other remaining heir to Daniel’s will was Sarah who married James Barnett in 1819 at St Nicolas’s Church in Bristol. Guy Thurston died in 1829 and left a will dated 18th May 1825. James and Sarah Barnett. James Barnett was probably baptised in Thornbury on 29th September 1799, the son of John and Sarah Barnett. John and Sarah lived at what later became 49 High Street. His sister Mercy Barnett married Jacob Husband in 1831. Click here to read about Mercy. James Barnett married Sarah Thurston in 1819 in Bristol. Sarah was the daughter of Guy Thurston the tallow chandler who had owned this property previously. The record of his son’s baptism on 17th February 1822 in Thornbury shows that James was working as a carrier. By 1824 he was a tenant at 34 High Street. The baptism record of his son James in 1822 describes James as a coachman. Other baptism records show that James had various jobs including coachman, carrier, servant and labourer. In April 1831 James Barnett of Thornbury was one of the signatories to the petition for the Reform Bill. When James and Sarah Barnett raised a mortgage of £200 on property that included Stokefield Cottages and four messuages in Rockfield in Monmouthshire from John Corbett Neale on 12th December 1832 the indenture said that James Barnett then occupied one of the pair of houses made from the division of the original property inhabited by Susannah Facey. The trade directories for this period show that James’s brother Thomas Barnett was running a carrier service to Berkeley Dursley and Bristol. In 1835 having discovered that Guy Thurston had not died intestate but had left a will securing an income from his properties of £7.00 a year for his wife Sarah, Sarah Thurston agreed to give up her life interest in the property. James and Sarah Barnett were able to repay the mortgage on the properties by transferring the ownership of them to John Corbett Neale who also paid them £70. James and the family still ended up living in the Workhouse. There is a report in the Workhouse records in 1837 showing James left without permission, leaving his wife and family there. The Guardians of Thornbury Workhouse offered a reward of two guineas for his capture. We know from a declaration made by James’s wife, Sarah on 16th January 1874 that James had abandoned Sarah and the children about 35 years previously. Sarah said James had deserted her without saying anything to her and she never knew where he went or received a letter or anything else from him since that time. She had been informed some months after James had left that he had written from London a letter to his brother, Thomas Barnett, asking for money. Sarah listed her children as: William Barnett, baptised Thornbury Parish church 17th September 1822, died aged about 25 at Bombay in India. He was a private in the 14th Reg Dragoons, John Sampson Barnett baptised Thornbury 8th August 1824 died about 47 buried in Ledbury, James Barnett baptised Thornbury 1st October 1826 died about 39 in Bengal in India. He was a private in the Royal Artillery, Francis Thurston Barnett baptised Thornbury 1839 died about nine years and buried in Almondsbury, Thomas Barnett baptised Thornbury 2nd November 1831 died about 8 years and buried in Thornbury Churchyard, Daniel Thurston Barnett baptised Thornbury 15th June 1834 (according to the 1871 census Daniel had been deaf for 30 years), and he had moved to Ross by the 1851 census, Eliza Ann Barnett baptised Thornbury 9th May 1838 also moved to Ross to join her mother, and Frances Barnett baptised Thornbury 11th September 1839 died aged 3 months and buried Thornbury Churchyard. The 1841 census shows Sarah living with her children, Thomas, Daniel and Elizabeth, in the Thornbury Workhouse and her daughter, Frances, had been born in Workhouse in 1839 and died there. Sarah mentions that she had lived in Dursley and Worcester before finally settling in Ross in Monmouthshire. She was living there at the time of the 1861 census. We have been told by Sue Lynch who has been researching the Barnett family on behalf of a friend, that Daniel, Eliza and her illegitimate son, William, sailed on the Otago to Queensland in May 1884. Daniel died in Queensland in 1891. Another illegitimate child of Eliza’s, Lottie, joined her mother in 1899. Eliza also settled in Queensland and she died there in 1921. John Corbett Neale. An indenture made on 21st January 1837 between John Corbett Neale, James and Sarah Barnett and Sarah’s mother Sarah Thurston finally conveyed the properties to John Corbett Neale. A family tree on the Ancestry website says that John Corbett Neale was born 1st August 1792 in Yate and that he was the son of John Neale and his wife Nancy nee Corbett. On 7th December 1816 John Corbett Neale married his cousin Tryphena Corbett, the fifth child and only surviving daughter of Jonathan Corbett. The 1840 Tithe Apportionment for Ridgewood near Yate shows that they lived in that area. A conveyance of 1848 says that he lived at the Ridge House in Yate. According to the Richard Nixon Presidential Library in the White House Special Files Collection their children were; Robert Neale baptised 1st May 1819, Jonathan Corbett baptised 19th November 1821 and died 15th July 1830, Alfred baptised 25th March 1827, Jonathan Corbett baptised 10th January 1832 and died 19th November 1895 and Matilda baptised 18th August 1817. We do not know the relationship if any of Richard Nixon to John Corbett Neale. By the census of 1851 John Corbett Neale described as an annuitant and his wife Tryphena were living in Ridge House in Yate with their son Robert and his family. John Corbett died on 30 May 1853 at Westend House at Wickwar aged 60 and was buried at Yate. His will made 13th July 1841 bequeathed to his wife all his money etc except leasehold cottages and £200 ANNUITY estate at Wickwar mortgaged for £1500 subject to the life of Dame Grace Elizabeth Neale, properties in Wiltshire and Dorset and in Monmouthshire which he purchased of James Barnett and land called Northfield Close in Yate. He also referred to several leasehold cottages and gardens in the parish of Thornbury which he purchased of James Barnett. These were left to his friends Tobias Sturge of Croydon Gentleman, William Gale of Horton Gentleman and Richard Barber Gentleman in trust to sell after his death. His will was proved at Canterbury on 14th December 1853. By August 1856 a large amount of the estate of John Corbett Neale was put up for sale. The 1861 census shows Tryphena living in Bedminster with her son Jonathan aged 29 who was said to be a retired civil engineer. The 1859 1862 and 1867 rate books show that Mrs Neale now owned these four cottages and a shop run by Mrs Gastrell. John’s widow Tryphena died on 21 May 1876 aged 78 and she was buried at Yate five days later. Henry Craven St John. The Rate Books from 1876 show that these properties were bought by Henry Craven St John by that time. Trustees of Eleanor Rodney. These properties were bought from Henry Craven St John by the trustees of Eleanor Rodney on May 8th 1890. This description clearly refers to the four cottages opposite the Chantry at the bottom of Castle Street and known as Stokefield Cottages. Click here to read more about Eleanor Rodney whose trustees acquired these properties. William John Francis Dutson bought the estate of Stokefield House including the cottage on 22nd September 1930. Thornbury Rural District Council. Thornbury Rural District Council bought from William John Francis Dutson the building known as Stokefield and sometime as Clouds and 10.342 acres of ground, including Latteridge on 29th September 1958. Click here to read about Stokefield House as Council Offices. During this time the cottage was used to house the caretaker. Northavon District Council 1974- 1996. Northavon District Council was created in 1974 under the local government reorganisation of the time. On the 4th November 1985 work commenced on the construction of new civic offices for Northavon District Council. During the construction the property now known as “Stokefield House” was demolished. The building (shown here on the right in a thumbnail image) now occupying the site looks rather different from the original Stokefield House. Stokefield Cottage became part of the new office block in 1984. In 1996 the greater part of Northavon District Council was merged with Kingswood District Council to become South Gloucestershire Council. As the administration of the County was gradually centralised in Yate, staff were moved away and in 2015 the building stood empty. In 2017 the whole building was demolished and the site being re-developed as a retirement complex.